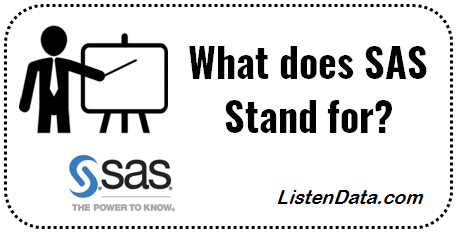 It is often asked in interviews "What does SAS stand for?". I believe it's one of the most stupid question to assess someone's ability to program in SAS. But interviewers ask to see if a candidate is prepared enough and read about wikipedia of SAS Software or 'About' section of the SAS website. The two common responses of this question we generally receive - ' Statistical Analysis System' and 'Statistical Analysis Software'. The question arises which one is correct. What does SAS Stand for? In 1980s, 1990s and early 2000, SAS was an abbreviation of 'Statistical Analysis System'. At the present time, officially there is no full form of SAS. It's just SAS. You might wonder why SAS institute did this and what would make this any difference. There are a lot of presumed stories related to it. One of the most popular one is SAS institute offers various analytics and business intelligence tools nowadays so they don't want their name to be restricted to only Statistics. So the next time if someone ask you this question, your answer should be 'SAS is SAS, no abbreviation'. If interviewer has no idea about it, explain him the history of SAS name. 2 Responses to "What SAS Stands For"